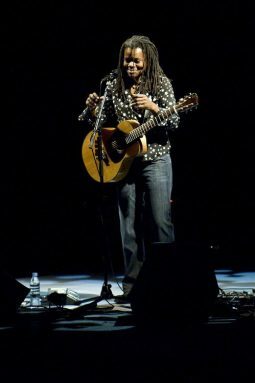 She can hardly believe it herself, but it really has been 20 years since Tracy Chapman began her professional career as a musician, which to us can be visibly pinpointed with her powerful performance for Nelson Mandela’s 70th birthday at Wembley Stadium, when apartheid was still a reality in South Africa. 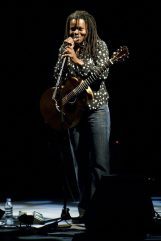 It is also exactly 20 years since she released her debut album Tracy Chapman, the home of Talkin’ About A Revolution, Baby Can I Hold You and undeniably her most prolific song, Fast Car. 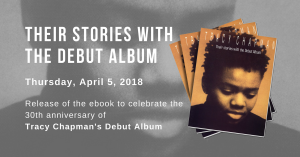 Officially, Chapman is touring to promote her 8th album, Our Bright Future, which she co—produced with Larry Klein, who has worked with Joni Mitchell and played bass on Chapman’s first two albums. She confides to us that she left the band behind this time (later she urges us not to tell them what a lovely evening it’s been) because she wanted to strip away the last 20 years to return to her beginnings on the Boston coffee shop circuits, “when it was just me and my guitar.” The stripped-down performance also showcases possibly her best instrument, her voice, and the songs are all the better for it. After launching into Behind the Wall and Baby Can I Hold You, she says she has much to tell us, which kicks off an evening where she holds court with an unprecedented level of banter, frankness, and thoughts on her music and her influences. For the people who have followed her career, this is an unimaginable treat. Almost every song is bookended by an anecdote or a little explainer. For example, Subcity, off her second album, Crossroads, was written “at a time when Reagan was still President, this actor was our President, and we didn’t think it could get any worse… little did we know,” she laughs. Mentioning Reagan reminds us that she has come full circle on this tour in more ways than one; when she began playing music professionally Reagan’s era was in its twilight after presiding over probably capitalism’s most excessive decade, which is a teasing déjà vu to this year’s end. Chapman’s speaking voice, while undeniably deep, has a disarming gentleness to it, almost as if she intentionally softens it for our ears. She is always a polite performer but she has extra smile in her voice tonight. She is generous with the anecdotes—it is like discovering a new catalogue of forgotten songs, and yet serves to remind us how little she shares of herself personally, if not politically. She has been outspoken on many social issues but less so on herself. For all her opinions she remains a private figure, and despite her longevity she has remained a mystery, but one that is wholly without affectation—her private nature is nothing if not genuine. She kicks off her confessional by telling us about her first busking efforts, which were unsuccessful as a money-making venture in high school (an Ohio native, she earned a scholarship to a prestigious boarding school in Connecticut). She was more successful when she got to college (Tufts University in Massachusetts, where she studied Anthropology) when during a winter break she managed to scrape together enough change busking in Harvard Square to buy Chinese food for herself and a friend. Chapman has always been accommodating about playing her crowd pleasers, as if she is under no illusions which songs people hope to hear. She plays only three songs from her new album but almost every song from her debut, although some more obscure favourites get an airing thanks to her ingenious attempt to be “flexible”, another reason she left the band behind at home. She placed a request box in the Apollo’s lobby for people to write down song requests. For this purpose she has almost done away with a set list and informs us she has been busy rehearsing almost every song so that she can play them all if called upon to do so. From this stack of cards she brings out America, from her last album, Where You Live, as well as The Promise, Mountains O’Things, and Fast Car (for “Jerome’s mother, who lives in South Africa”). She is also clearly tickled by one card in particular, on which a teacher wrote an essay question they set their class earlier in the day. “I think someone wants us to do their homework,” she says. “It says here, ‘Discuss the nature of secularism in civil society.’” She uses this as a springboard to set up a song from her new album called Save Us All, about the prominence of religion in American politics and the “evangelicals that are trying to save us, when I think we need to be saved from them.” This essay question becomes a theme for the night—framing a recurring subject in the songs she plays for us: America. “I guess you write what you know,” she says. But her country is clearly on her mind tonight. Perhaps she is so chatty because she is hopeful about the future of her country. Of course the election would mean a lot to Chapman, as a spokesman for racial issues, as an American, an African-American, as a woman, and a citizen of the world, perhaps also as a musician. But she has an extra dog in the race because it is her home state, Ohio, which swung ‘blue’ this year by voting for the Democratic party, a big part of Barack Obama’s election victory. When she introduces Across the Lines, she explains that she wrote it about her home town, Cleveland, a racially segregated and impoverished city. The song touches upon the riots caused in part by the enforced integration of the city’s schools, which she experienced first-hand. She does not mention Obama by name but she praises her state for being able to elect someone for their qualifications rather than their appearance, saying: “Even in America things can change, you would expect it to be easier but it can be very rigid.” The audience hoots and whistles (“whoop whoop!”) when it becomes clear who she is talking about: we have been waiting for her to mention the apparent sea change everyone is expecting-it would be a shocking omission if she didn’t. She resonds with: “Whoop whoop indeed!” She also reveals that growing up she never listened to folk music (this is the music store folder she is usually slotted into) because the radio stations and by extension the music people listened to were also segregated—she grew up exposed to ‘black’ music like soul and R’nB, she explains: “Today that it still the case but now they call it ‘urban’”. Chapman shares the stage only with a red mug of tea (she has had a British, lingering cold) and the occasional ghostlike figure who scurries onto the stage to exchange guitars like a scene shifter, or a musical golf caddy. Her lead single off the new album, Sing To You, a musing on the role music has played in her life, is well-suited to the solo performance. Her voice is accompanied only by the barest of banjo string-picking and it makes an immediate impression. Many of Chapman’s songs, even in the studio, have a simple arrangement and simple chord progression, which means they lend themselves well to live acoustic renditions. Talking About A Revolution in particular loses nothing from the lack of backing clutter. Songs like New Beginning’s Bang Bang Bang, which is more strum-heavy, drown out her voice somewhat. On the other hand the blues-toned (and Grammy-winning) Give Me One Reason benefits from the intimacy, as does a bare bones version of House of the Rising Sun, which she plays for the people of New Orleans after Hurricane Katrina. She tells us before she plays another debut stalwart, She’s Got Her Ticket, about a young girl with no chances that escapes and “finds her place in the sun,” that she wrote the song for her sister—a fact which I have never found record of either in print or in recorded interviews. Chapman is at her best singing the altogether more minor-toned melodies which let her voice carry the song—for which she may have earned a reputation as serious and taciturn, but the quality of the songwriting can’t be faulted. Besides, a reputation for humourlessness is clearly undeserved: she draws laughter from the crowd easily. A brief encore has her experiment with audience shout-out requests which quickly descends into chaos, (a testament to the extensiveness of her repertoire) but she manages to pick a couple out of the din, before leaving us with Hallelujah and thanking us for a lovely evening and disappearing. It is striking that for all her verbal enthusiasm this evening, Chapman is not as forthcoming when it comes to songs dealing with love and emotion—she reveals nothing personal on these fronts, no anecdotes to anchor the songs’ meaning in her life. I find myself wondering which songs may have been written about lovers and friends or whether none of them have roots in her experiences. On the cabaret-like I Did It All, about a hedonistic woman’s memories, she is hasty to underline that it is purely a figment of her imagination, and also gently warns us that in general, people tend to wrongly assume songs are autobiographical when so many of them are products of a fertile imagination. This verbal fluke has left us with a bit more of Chapman, but we also know how much of her remains hidden from our view. It is only her music which is for public consumption; even her performance style and body language does not give much away, almost as if she wants nothing to distract us from the music she plays. This is as refreshing as it is frustrating, but there is certainly something to be said for knowing a musician (and Chapman is certainly that) by their music, rather than their life. 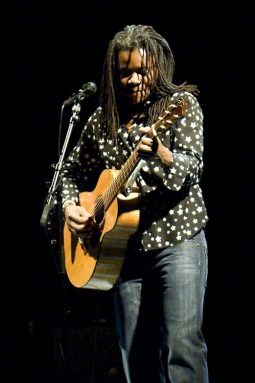 With only one hit single to her name over here, it’s understandable that 20 years on Tracy Chapman is back to her solo busking roots. But two nights at the Apollo towards the end of a long European tour are hardly reduced circumstances. A remarkably rabid crowd cheered her bare stage, plain clothes and acoustic guitar as though they were all made of fireworks. There was whooping at odd times, such as during Behind The Wall, an a cappella song about domestic violence, and more appropriately, when the persistently political singer praised America’s decision to put faith in Barack Obama. “Woo woo, indeed,” she said. They seemed thrilled to be among the thousands experiencing an intimate, relaxed evening with an ordinarily shy performer. “I was just kind of marvelling at myself,” she said, remarking on her own chattiness in a surprisingly croaky, teenage boy’s speaking voice. When she sang, her vocals formed an enveloping duvet, warm and familiar, even giving new soul to the overplayed The House Of The Rising Sun. Her own overplayed tunes, from her huge-selling self-titled debut of 1988, remain adored to the extent that people were still shouting for Fast Car after she had played it. That song stood out of course, along with Baby Can I Hold You and Talkin’ Bout A Revolution but the time between did not drag when there was America’s underclass (Subcity), the racial divide (Across The Lines) and gun culture (Bang Bang Bang) to be covered. The lack of band meant less power on new tracks such as Save Us All, which took evangelical Christians to task but the benefit was an obvious feeling that she was actually enjoying herself. Still having fun in your job, two decades since your peak, is an admirable achievement in any field. I’ve owned her first two albums since their release but apart from playing them regularly over the past 20 years or so I’ve not really kept in touch with her. That was until tonight at the Apollo.She came across as a very nice lady with a good sense of humour.That and a wonderful voice that doesn’t seem to have changed in 20 years. Hey – the show last night was f*****n amazing, Tracy was better that I’ve ever seen her before. Having just her and her guitars makes it so much more personal, it was brilliant. Shw was so charming and humble the whole time, it was amazing, and really chatty. I also had center seats right up front in the 6th row, it was spectacular, one to remember! The Promise and Mountains O’ Things. She did nearly the whole of the first album. It was a really amazing show, she seemed completely at ease and spoke much more than she has done on the previous two times I’ve seen her live. Does anyone know the surname of the support act? James … something. Thank you for the setlist in order! I love her voice. She is so sympathetic! We missed her concert in Amsterdam, but we definitely had to see her. So decided to go to London. Great audience too. Having snapped 2 tickets for £50 on e-bay a week before, I was really looking forward to watching an artist I’ve followed since I was a Chemistry student in London. After a warm up by an Irish artist whose name I forgotten, she came on stage. Unassuming, stripped of all pretence, and of all support, other than a 5,000 sell out crowd at the Hammersmith Apollo willing her to carry on singing to them. 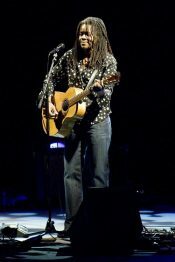 Watching Tracy Chapman perform live is an experience that is both humbling to witness as it is gratifying to listen to. This was a solo tour in every sense of the word. No backing band, no gospel choir, nobody else. Just a musician, her guitar and an ocean of talent. In today’s age of over produced, over marketed X-Factor celebrity, here was a powerful reminder of raw talent that has spanned 3 decades and 9 albums. “She’s got a ticket” were mixed in with love songs that evoke a purity and longing that is rarely found within popular music. I defy anyone to listen to “The Promise” live, and not feel a lump rise in their throat. 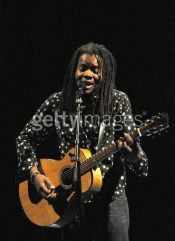 You are unlikely to go to a Tracy Chapman concert and end up losing your voice, from having sung so much. You are unlikely to get out of your seat at all. I don’t think I did once during the gig. But for all of that, it doesn’t mean, you’re not touched by the presence of her voice, or you’re not anything but totally mesmerised for over 2 hours. She did at one stage, ask the audience for requests to which she received a cacophony of noise, which she appeared a bit overwhelmed by. At times, she almost looked embarrassed by the level of applause she was getting, and you wish in a way that she had a bit more ego. But then, not being showy, is definitely part of her charm and we wouldn’t have it any other way. 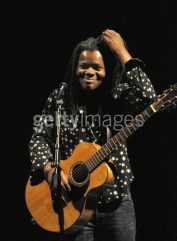 Tracy Chapman – A legend that doesn’t know it. Wow, what a person, what a voice, what an experience. On a simple set that involved Tracy, her guitar and a microphone, she performed an acoustic set that even surprised me. Even though knowing Tracy has an amazing voice, listening her sing in person with nothing but a guitar, is something else. The purity of her voice and the strumming of her guitar had me and 5000 others sitting, staring and listening to every word in awe of this incredible lady. Whether A Capella or acoustic her brilliant voice filled the venue with a sound that had everyone blown away. Behind a shy but charming lady there is a voice that is so pure and unique. Exposed to a room of 5000, she began her set by singing “behind the wall” to a backdrop of a sunrise, not a sound in the room but her voice and a few whispers amongst the audience. If that set the standard for the rest of the night we were in for something special, and special it was. On the simplest of the set, consisting of a backdrop canvas that saw the progression of the sun from sunrise through to sunset, her voice, her guitar and cups of tea, she covered a range of songs that have spanned the 20 years of her career thus far. She covered favourites such as “Fast Car”, “The Promise”, “Baby Can I Hold You”, and finished with “Talkin’ Bout a Revolution” before her encore which included her covering “Stand By Me”. 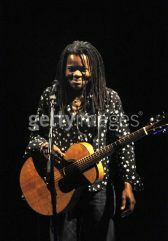 A great artist to watch… forget the C.Ds and Mp3’s… she best live and acoustic I walked in knowing of Tracy Chapman, I walked out a fan of Tracy Chapman.